UK gaming accessory company Gioteck wants you to design the ultimate gaming peripheral, and is offering participants the chance to win a “dream job” in the game industry that could be worth up to £500,000 if your design is a success. 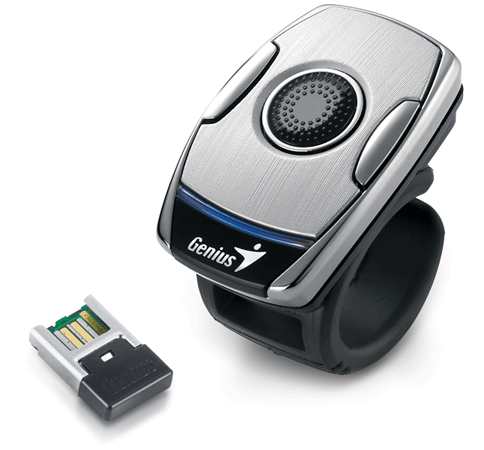 Good news for those hoping to try on a new ring during their visit to Las Vegas next month: Genius will be showing of the followup to its Ring Mouse peripheral at CES. Not a ton of information on what makes the device different from its predecessor, but the company's promising some hands-on time with it as well as the new GX Gila Gaming Mouse, which offers up a DPI range of 200 to 8,200 and an "Angle Snapping" feature for better cursor precision. The previously announced Touch Mouse 6000 for Windows 8 will also be getting some time to shine at the show. Help us make the worlds first open-source controller. *Will it work with the OUYA - Yes, it should work with the OUYA. *Built to last - the price reflects the quality - it's an absolutely solid, ready for the road design. *Distributors - buy a multipack and have excellent Christmas sales. *If the project is a success we will document the ENTIRE production process on film - with regular video updates and visits to factories - see how we bring a product to life - ordering parts, negotiations, product assembly - everything - so if you have always wondered how it's done, or fancy making something yourself in the future, you will see how we do it. Hold any touch screen phone,from the iPhone4 to the giant Note series (see video)! Between 2009 and 2011 we developed, prototyped and brought to market the iControlPad; a unique controller which connected to phones to play games. Now we want to go one better; a programmable, open-source, Bluetooth, super-compact controller with a keyboard that you can use on almost any tech device. The iControlPad2 is not tied to phones or tablets. It is designed to be used with anything from your Raspberry Pi, Dev-board or USB Stick computer, to Robots, hobby projects, PC, Mac, bare PCBs/Motherboards, set-top boxes and anything else with Bluetooth. If you do use it with your phone, it can attach via a swivel-holder for comfort, and is easily stowed when you take calls - as the battery lasts for 12-14 hours it's a great portable controller. And it's open source. So if it does not do what you want, you add your own commands/protocols, or download ones made by other users. Emulation: With the iControlPad2 you can enjoy proper computer emulation on your phone or tablet. Imagine Amiga/C64/PC/ZX Spectrum/Atari/Amstrad all with complete Keyboard, Mouse and Joystick emulation on one small controller; not to mention amazing support for almost any console emulator. Unrivalled control set: A full QWERTY keyboard, digital D-Pad, 2 analogue nubs, 4 face buttons, Start, Select and 2 shoulder buttons. Everything you need in a compact device - it's the same size as an iPhone4. No need for App support: The iControlPad2 will work with almost any app, whether it supports it or not. Thanks to new overlay software, you can map the iControlPad2 controls and keys to screen presses in iOS or Android. Just map your favorite app and start playing; you will be amazed at the advantage real controls give you. See the video for a demonstration. Spread the word to as many sites as you can and help get this project going. Continuing my work updating the DCEmu sites, making sure they work properly and updating links and making new additions etc. Today its time to look at our Joypad News site which focuses on the latest releases/news of Joypads and gaming accessories. The news is from all corners of the world and the sometimes wacky ideas released for consoles. The site is half automated posting and the other half by me and has nearly 4 years of news on it which you can check out via the news archive on there. For those that absolultely can’t wait to get to experience the Oculus Rift, you can follow these plans to build your own. MTBS3D forum user [Rfurlan] pledged in the oculus rift kickstarter (which concluded last night), but simply couldn’t wait till November/December to get his developer kit. That, and he’s probably only getting one, and who can live with only one? Since [Palmer], the creator of the oculus rift has been very open about parts, [Rfurlan] was able to compile build instructions for your very own Oculus Rift! Keep in mind though, this is only the immersive display, not the tracking component. It is also, possibly not exactly the same as the oculus, but rather the same as a recent prototype. At one point he was having issues finding the correct lenses and [Palmer] jumped in to make some suggestions to keep things going. That’s the kind of enthusiasm that we love to see from an innovator, even when he’s in the middle of a kickstarted for the very item that [Rfurlan] is creating. This is a testament to the VR community. Lets take a look at what makes this thing tick, and why it is such a big deal. Hackaday has seen a ton of builds make use of the Arduino CapSense library of late, so it was only a matter of time before we posted a capacitive sensing game controller that is able to move sprites around a screen. For this build, the controller is made out of small strips of Aluminum foil, wired straight to an Arduino with a few resistors. Once embedded inside a wonderful enclosure that brings about pangs of nostalgia it’s time tow write the game. For the game portion of the build, Processing was brought into the mix to create a SpongeBob-themed ‘capture all the jellyfish in jellyfish fields’ game. By taping the contacts for the d-pad, the player can move SpongeBob around to catch jellyfish. If you’d like to give the game a go, you can play it in your browser on the project page. A brand new peripheral is threatening to eclipse the advances made by technologies such as Microsoft's Kinect. Called Leap, the small device – which connects via USB and is about the size of a flash drive – is said by its developers to be 200x more accurate than any other motion sensing equipment on the market. It can apparently track movements down to 1/100th of a millimetre. It can track all ten thumbs and fingers as they interact with a 3D space (up to eight cubic feet in size) established around a user’s PC. It can also track pen movement and does an amazing job of tracking handwriting, as is seen in the video below. It will support Windows 8 out of the box with Linux compatibility currently “on the agenda”. Each Leap unit will retail for $69.99, with the limited initial shipments scheduled to become available this winter. Free developer kits are also being offered. [Tim Caswell] has been using gamepads and joysticks to demonstrate his node.js hacks for a long time. The thing is, he has been relying on C++ bindings to handle the hardware while trying to herald the praises of node.js. Why not cut out the middle man and write a joystick driver in node.js? It turns out to be so simple anyone can do it. Granted, this is not a kernel driver. He’s relying on the Linux kernel to recognize the hardware and provide him with the customary /dev/js0 file which he can then work with. As you can see in the snippet above, he’s looping through code in order to constantly read from the hardware. To get this far he dug through the documentation for joystick packets (yay for open source!) to find that each is made of a 32-bit timestamp, a 16-bit value, and two 8-bit numbers identifying the event type and button or axis. Once he has the packets, it’s off to the races. Each data type is parsed into an appropriate variable which you can use in the logic of your own program. Don’t be nervous, this will make a great weekend project! The Oculus Rift has caused a wave of excitement on crowd-funding site Kickstarter. The virtual reality headset reached its target of $250,000 (£160,200) within its first four hours of going live on the site. The gadget has gained support by some of the PC games industry’s leading figures who agreed to appear in the promotional video. Doom creator John Carmack, Valve’s Gabe Newell and Cliff Bleszinski, design director at Epic Games, all took part in the promo video, which you can view at the Oculus Kickstarter page. The Oculus Rift virtual reality headset promises gamers an immersive experience using a 640 by 800 pixel screen for each of the user’s eyes.